The oldest bank in Lake County, Two Harbors Commercial State Bank was established by Captain Joseph Sellwood and D. A. Burke in 1889 as Sellwood, Burke, and Company. Its board of directors included Dr. J. D. Budd and John Dwan, who founded 3M. The private bank reorganized in 1908 to comply with state bank laws and changed its name the same year. 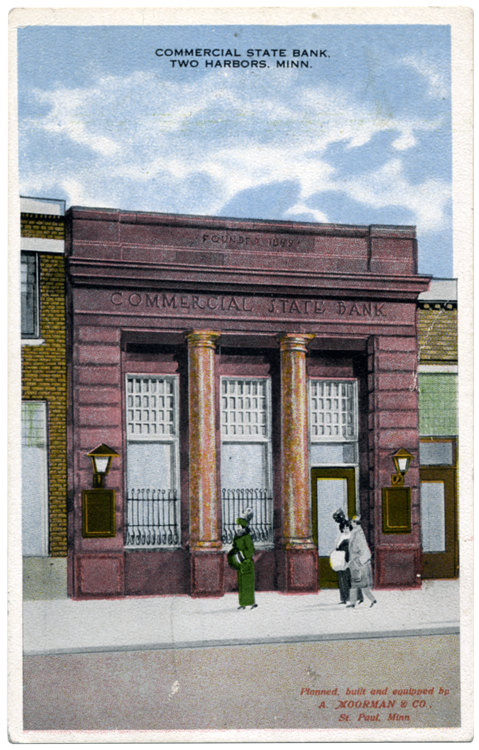 The bank, built at 613 First Avenue in 1915, was made as safe as the technology of the time would allow. Its steel-lined vault included an electronic burglar alarm system that was added in 1921. Unfortunately, the bank’s marble pillars were hauled away during a remodeling project in 1962. Captain Sellwood, the bank’s president, lived in Duluth and built the Sellwood Building that still stands at 202 West Superior Street and three homes at Eighteenth Avenue East and Superior Street (one for himself and his wife and two as wedding presents for his daughters). Sellwood also owned the Brotherton Mine near Lake Sunday in Michigan’s Gogebic Iron Range. He had first come to Michigan from his native Cornwall, England, to work in northern Michigan’s copper mines. The bank sold in 1999; it is now known as the Lake Bank and has an office in Silver Bay.